This year has been the worst year for hedge fund shutdowns since 2008. 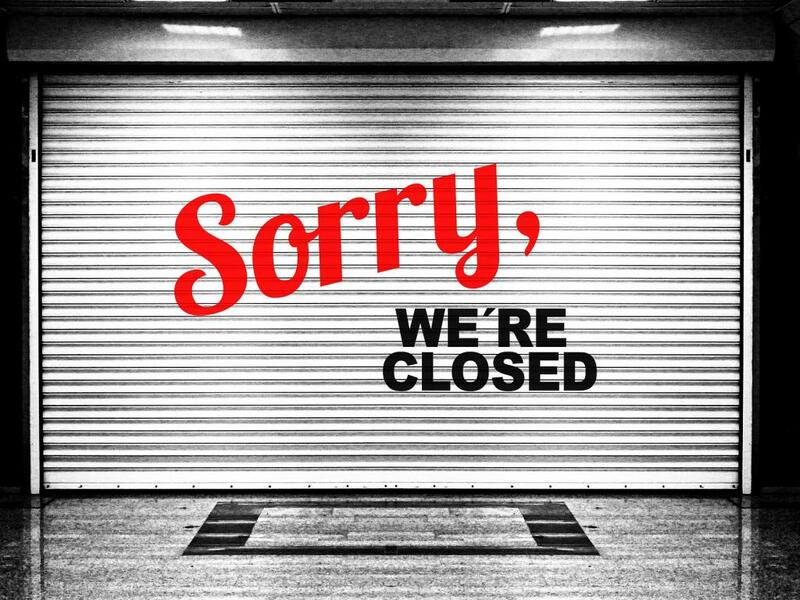 More than 400 funds shut down in the first half of the year. Of the remaining funds, average 2015 returns are nearly flat. There’s no doubt about it: 2015 has been a rough year for hedge funds. New data from Bloomberg indicates that more funds have shut down this year than in any other year since the Financial Crisis. Here’s a look at just how bad it’s gotten. According to Bloomberg, the total combined assets of the hedge funds that have shut down so far this year is about $16 billion. 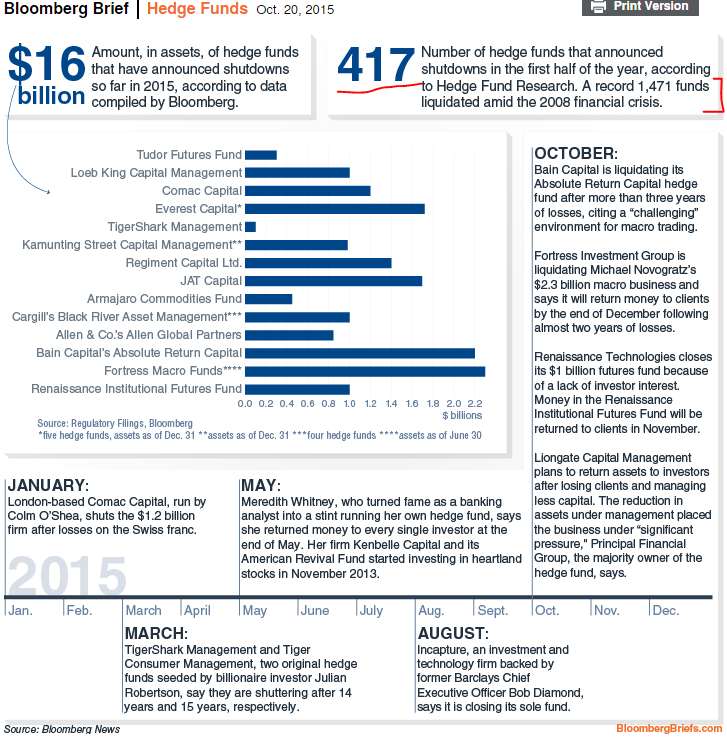 A whopping 417 hedge funds closed down in the first half of 2015 alone. Although that number puts this year’s shutdowns well behind pace of 2008's 1,471 total hedge fund shutdowns, it’s safe to say that market conditions in 2008 and market conditions today couldn’t be more different. 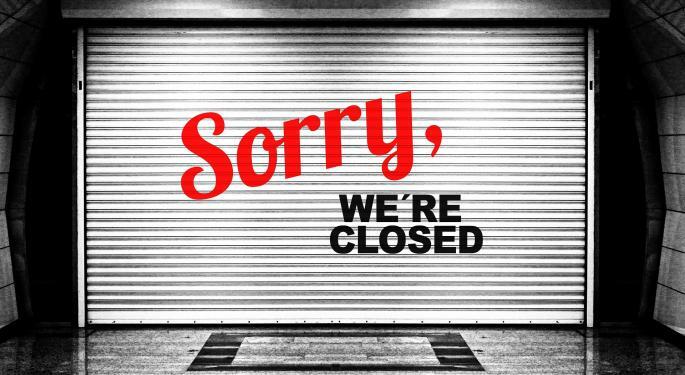 The list of funds that have been shut down so far this year includes some large, well-known funds. Just this month, Renaissance Technologies closed its $1 billion futures fund due to lack of investor interest. Bain Capital also announced this month that it is closing its $2.2 billion Absolute Return Capital fund after three years of negative returns. It’s not just the funds that are shutting down that have been struggling in 2015. As of October 15, the average hedge fund had returned a paltry 0.18 percent this year. Even some of the biggest names in the business have fallen victim to unpredictable market conditions this year. Through the end of September, some of the biggest losers in 2015 include Bill Ackman’s Pershing Square Holdings (-9.6 percent), John Paulson’s Paulson Advantage (-12.0 percent), Leon Cooperman’s Omega Overseas Partners (-12.0 percent) and David Einhorn’s Greenlight Capital Offshore (-16.8 percent). The IQ Hedge MultiQ Hedge Multi-Strategy Tracker ETF (NYSE: QAI) is down 1.1 percent this year.